When it comes to affordable wine, we live in an age of abundance. High quality, value-priced wines of all types are made in increasingly large quantities, running to tens of thousands—even hundreds of thousands—of cases. It's natural to focus on these high-production bottlings when we select the best values of the moment, and in each issue we point you to wines you can easily locate on retail shelves or wine lists. But sometimes it's worth digging a little deeper to find what you're looking for. That's the idea behind this roundup of 110 reds, whites and rosés from California, Oregon and Washington. They all represent excellent value, yet are produced in smaller quantities of 500 to 4,000 cases, demanding a bit of legwork to track them down. Think of yourself as a treasure hunter, map in hand, looking for gems in the hillsides and valleys of West Coast wine country. Focusing on smaller-production wines allows us to highlight bottlings that are often overlooked when the subject of values comes up. Better still, many of them are made by small, family-owned wineries using estate-grown fruit or by bigger producers spotlighting specific vineyards or less-familiar grapes. This scale lets winemakers experiment more in the cellar, expanding their range of grape combinations and flavor profiles. Each of the wines selected here—all of them scoring 88 points or higher and priced at $25 or less—shows an attention to detail and the distinctive stamp of their makers. Bonny Doon's Picpoul from Arroyo Seco's Beeswax Vineyard, for example, is a delicious version of this southern French variety for only $18, offering melon and pear flavors that show a good minerally edge and firm acidity. At fewer than 900 cases produced, it might slip under your radar, but you shouldn't let it. The hunt is on. Lively and full of personality, with raspberry, smoked pepper and orange peel aromas opening to zesty, layered red plum and licorice flavors that move at a snappy pace toward the finish. Syrah, Grenache and Mourvèdre.—T.F. This is an elegantly spirited Pinot, with bright cherry and spice aromas and plushly complex raspberry and brown baking spice flavors that linger on the polished finish.—T.F. Densely structured, yet retains a sleek sense of grace, with smoky blackberry, stony mineral and spice flavors that persist toward broad-shouldered yet refined tannins. Cabernet Sauvignon, Merlot, Syrah and Petit Verdot.—T.F. This is precise and well-built, with refined black cherry and black tea flavors that build dimension toward polished tannins.—T.F. A silky and graceful version, showing generous complexity and expressive cherry and savory tea flavors that linger on the finish.—T.F. Polished and sleekly structured, with expressive huckleberry, sassafras and licorice flavors that take on depth toward refined tannins.—T.F. Pairs elegant fruit with a zesty sense of gaminess, accented by dried cherry, smoky dried herb and subtle leather hints that take on richness toward the refined tannins. Grenache, Syrah, Mourvèdre, Counoise and Cinsault.—T.F. Distinctive, with floral pomegranate and sweet anise aromas leading to briary, well-built cherry and spice flavors that linger on a lively finish.—T.F. Briary and full of verve, with wild berry, mocha and orange zest aromas and lively black cherry and licorice flavors.—T.F. Elegantly complex and polished, with expressive black cherry, mocha espresso and spice flavors that linger on the finish. Cabernet Sauvignon, Malbec, Merlot and Syrah.—T.F. A spirited Zin, with good structure and zesty flavors of black raspberry, cracked pepper and savory licorice.—T.F. A generous and lively Pinot, delivering supple flavors of raspberry and baking spices that dance along the vibrant finish.—T.F. This well-structured red offers concentrated flavors of dried raspberry, mocha, red currant and dark plum, with creamy accents midpalate and firm tannins on the finish.—K.M. Sleek and refined, with expressive black cherry, licorice and sassafras flavors that glide easily along the finish.—T.F. Lively and harmonious, with red currant, smoky tea and spice flavors that take on polish toward refined tannins.—T.F. This is sleek and pretty, offering lively violet, raspberry and spice notes that glide on the lingering finish.—T.F. Dense but well-structured, with boysenberry, orange zest and smoked pepper flavors that persist toward refined tannins. Syrah, Cabernet Sauvignon, Merlot and Cabernet Franc.—T.F. A sleek and vibrant red, offering expressive raspberry, smoky red pepper and espresso flavors that glide toward refined tannins. Syrah, Mourvèdre, Grenache, Cinsault, Carignane and Counoise.—T.F. Jammy and supple, this Zin features expressive cherry, bitter chocolate and pepper flavors that glide along the finish.—T.F. Bold and powerfully structured, with dark berry, crushed stone, black olive and smoky pepper flavors that are framed by ripe but muscular tannins.—T.F. This broad and generous version delivers lively boysenberry, smoky anise and cracked pepper flavors that build tension toward big but polished tannins.—T.F. Vibrant and juicy, with perky flavors of cherry, grilled anise and cracked pepper. A zesty quaff.—T.F. Richly spiced, with flavors of cherry and elderberry that show creamy accents. Merlot, Petite Sirah, Syrah, Mourvèdre, Grenache and Zinfandel.—K.M. Trim and savory, with raspberry and smoked pepper flavors that finish with an appealing touch of gaminess and slightly grippy tannins.—T.F. Vibrant and fresh, with lively cherry and spice flavors that glide sleekly along the lingering finish.—T.F. Delicate and demure, with rose petal, cherry and black tea accents that take on richness and depth toward the finish.—T.F. This version is focused and well-built, with delicate raspberry and orange zest flavors that glide toward a floral ending.—T.F. A precise and snappy Pinot, with raspberry, green tea and orange zest notes that glide sleekly toward refined tannins.—T.F. Well-built and persistent, offering floral cherry and green tea flavors that finish with refined tannins.—T.F. Fresh and lively, with appealing cherry and wildflower notes that finish with vibrant crispness.—T.F. Score: 89 | $25 | LUMOS Pinot Noir Willamette Valley Five Blocks 2014 | OregonThis crisp version is light-footed, showing notes of cherry and green tea that finish with snap.—T.F. A zesty style, with inky notes to the dried cherry and ripe dark plum flavors. Beefy accents linger. Merlot, Cabernet Sauvignon and Syrah.—K.M. 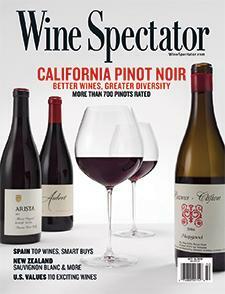 This Syrah offers zesty black raspberry and peppered meat flavors that linger toward refined tannins.—T.F. Lively, with currant, licorice and toasted spice flavors that end on a snappy note.—T.F. This sleek and easygoing Zin delivers flavors of cherry, dill and spice.—T.F. This red offers appealing boysenberry, rosemary and spice flavors that finish on a lively note.—T.F. A lively, zesty red, offering snappy black cherry and smoky jalapeño flavors.—T.F. This Zin is jammy and plush, showing smoky dark raspberry aromas that lead to soft cherry pie and grilled anise flavors.—T.F. This Zin features expressive black cherry and toasty oak aromas that open to zesty, medium-bodied plum, espresso and spice flavors.—T.F. Firm and fleshy, offering roasted plum and dried cherry flavors accented by notes of dried savory herb, with a hint of mocha on the finish.—K.M. A delicate and pretty version, offering easygoing cherry and cinnamon-spiced tea flavors.—T.F. This red is solidly built, with smoky raspberry aromas that lead to focused pepper and grilled anise flavors.—T.F. Score: 88 | $22 | SALEM WINE CO. Pinot Noir Eola-Amity Hills 2015 | OregonThis version is plump and user-friendly, showing appealing flavors of black cherry, spice and cola.—T.F. A snappy, lively red, offering spirited but easygoing cherry, violet and tea flavors.—T.F. Focused but slightly taut, with expressive red currant, red pepper and sage flavors that finish with dusty tannins.—T.F. Briary wild berry aromas lead to tart and zesty dried cherry, clove and licorice flavors in this Zin.—T.F. Potent and ripe, with blueberry and currant flavors accented by savory cinnamon and grilled anise notes.—T.F. Red and dark berry flavors are bright, vivid and snappy in this Cabernet, framed by firm tannins that grip without biting.—J.L. Vibrant, with mango-infused lushness to the core of citrus flavors on a fleshy body, showing a nice pop of acidity on the finish. Grace notes of peach, apricot and fresh herb linger.—M.W. This lithe white features baked apple and dried pear flavors that show accents of smoky richness. Plush and creamy midpalate, with a finish that has hints of honey and savory spice.—K.M. Vibrant and precise, with aromas of pear and nectarine leading to expressive notes of kiwifruit and more nectarine on the palate, as the flavors dance toward a creamy yet crisp finish.—T.F. Fragrant and floral, featuring honeysuckle and apple blossom aromas and good intensity to the pear drop, yellow apple and peach notes. Juicy and supple, with a long finish.—M.W. Crisp and light, but packed with flavor, this is bursting with ruby grapefruit, Meyer lemon and lime zest notes, with an appealing accent of lemon drop. The intensity carries over to the bright, refreshing finish.—M.W. Sleek, with mouthwatering pomelo, grapefruit and tangerine flavors that are precise and juicy. Shows excellent focus on the refreshing finish, where hints of lemon verbena come in, lingering effortlessly.—M.W. A sleek and delicate white, with floral lemongrass and lime accents that linger on the finish.—T.F. Sleek and focused, with discreet pear and lemon flavors accented by spice and hay notes.—T.F. This is complex, with a thread of minerality running through the lime and grapefruit flavors at the core, adding in a saline note. Lemon zest and roasted herb details gain momentum on the crisp finish.—M.W. Robust, with accents of dried mango and pineapple to the vibrant, juicy citrus core. Mouthwatering acidity keeps the flavors in focus, with hints of honeysuckle and wasabi lingering in the background.—M.W. This supple and lively white offers vibrant flavors of lime, grapefruit and petrol that finish on a crisp, clean note.—T.F. This juicy white has a plumpness to the ripe peach and nectarine flavors, with a squeeze of lime and a refreshing finish.—M.W. This features notes of dried tarragon to the fresh-cut green apple and lemon-lime flavors. The well-sculpted finish shows hints of flint and stone.—K.M. Peach, apricot and citrus flavors are polished and smooth in this white, with good intensity and a juicy finish, where a fleshy mango note takes hold.—M.W. Key lime and kiwifruit flavors are tangy at the core, with accents of orange zest and dried mango. Vibrant acidity really sings on the finish.—M.W. An elegant white, mixing pear, apple, lime blossom and mineral details on a sleek and refreshing body.—M.W. Tangy citrus, melon and apricot flavors are plump and juicy, with accents of lemon sherbet and green apple on the finish.—M.W. Creamy and spicy, with succulent melon, peach and nectarine flavors that are generous and lush. Spice and honey details linger on the finish. Grenache Blanc, Roussanne and Viognier.—M.W. There's tight, crisp focus to the pear and citrus flavors in this white, on a light, refreshing body. A floral note and white pepper accents linger on the finish.—M.W. This is delicate and pretty, with expressive tangerine, lime and melon flavors that linger. Viognier, Roussanne and Riesling.—T.F. Lithe, with crunchy apple, pear and ripe citrus flavors that offer tropical accents. The spicy finish has some smoky notes.—K.M. Mouthwateringly juicy, with a zingy core of lime, green apple and lemon zest flavors. Crisp and vibrant, showing plenty of energy on the finish, where a note of grated ginger kicks in.—M.W. Fruity and appealing, with passion fruit, mango and peach flavors that are fresh and juicy, showing nice intensity on the finish.—M.W. This juicy white offers nectarine, apple and pear flavors that are lively and well-spiced, followed by pastry notes on the finish.—K.M. Supple melon, spice and peach flavors linger in this delicate, pretty white.—T.F. Offers floral aromas of lime and nectarine that lead to crisp and perky peach flavors.—T.F. A spirited white, showing floral tutti-frutti aromas and easygoing tropical fruit and spice flavors.—T.F. Pear, lemon and pomelo flavors are sleek and pure in this white, on a light and juicy frame, with herbal accents.—M.W. Lively and fruit-forward, with zesty apricot and nectarine flavors.—T.F. Plump melon and pear flavors feature a thread of salinity that adds a minerally edge, with firm acidity and details of beeswax and pomelo on the finish.—M.W. A smooth and juicy version, with melon and citrus flavors that show appealing notes of apple skin. Turns spicy on the finish, where a touch of fresh ginger appears.—M.W. This is a fruit-forward quaff, featuring flavors of tropical fruit and lemon curd.—T.F. A soft and fruit-forward Chardonnay, with lively pear, spice and creamy lemon flavors.—T.F. Lively and fruit-forward, this version delivers zesty flavors of tropical fruit and spice.—T.F. Vibrant and crisp, with easygoing lime and lemon verbena flavors.—T.F. Crisp and vibrant, with honeysuckle and melon flavors.—T.F. Succulent peach, melon and mango flavors have a vein of vanilla bean and a hint of toast running through, smoothing out on the edges and lingering on the spicy finish. Grenache Blanc, Viognier and Roussanne.—M.W. This is crisp and precise, with easygoing pear and floral apricot flavors.—T.F. Fresh flavors of green apple, lime and grapefruit compose the core of this white, supported by zesty acidity, making for a long, clean drink.—J.L. Leafy, herbal and floral highlights surround a core of sleek lemon curd and lime zest flavors. This is juicy on the finish, with a lingering note of lemon verbena.—M.W. Clean and spicy from start to finish, with a trim band of citrus, green apple, lime and tangerine flavors.—J.L. Strikes a nice balance between ripe, spicy dark berry and currant flavors, with fine-grained tannins, making for an easy drink.—J.L. A full-bodied version, with flavors centered on apple, pear and melon. The oak plays a minor role in this drink-me-now style.—J.L. Crisp apple and pear flavors are sleek and juicy in this white, with a touch of lemongrass.—M.W. Crisp, with a lemon-lime core and plenty of fresh green apple flavors on a light body.—M.W. Fresh-cut apple and lemon tart flavors make for a lively mix in this white, with notes of melon and cream on the finish.—K.M. Offers citrus blossom scents amid a zesty core of green apple and snappy pear flavors, ending long and clean, with room to grow.—J.L. Peach, citrus and green apple flavors are light and refreshing, with an appealing touch of grapefruit pith on the finish.—M.W. Juicy, with plenty of buttery accents to the ripe white fruit flavors. Pastry notes show on the fresh finish.—K.M. Ripe melon and peach flavors are intense and smooth, with floral details and a juicy, succulent finish.—M.W. Easygoing and fruit-forward, with lively tropical fruit, pear and spicy cinnamon flavors.—T.F. Floral strawberry, watermelon and orange zest aromas lead to vibrant and pretty flavors.—T.F. This floral rosé is distinctive for its savory spice, raspberry and watermelon flavors. Grenache blend.—T.F. Crisp and vibrant, with lively strawberry and smoky spice flavors.—T.F. Snappy and refined, with strawberry and orange zest flavors.—T.F. A blush with gumption, offering lively strawberry and smoky pepper flavors.—T.F. Combines lively floral raspberry flavors with intriguing savory accents.—T.F. Zesty and distinctive, with lively cranberry, watermelon and smoky spice flavors. Syrah blend.—T.F. Vibrant and fresh, with raspberry and strawberry flavors accented by spicy cinnamon notes.—T.F. Fresh and lively, with vibrant strawberry and guava flavors that linger. Grenache blend.—T.F. Delicate and pretty, featuring crisp raspberry and orange zest flavors.—T.F. Crisp and savory, with lively raspberry and pepper flavors. Grenache blend.—T.F.